Transformed and re-evaluated by national interest it became the basis for the heroic myth. It provided the early Jewish settlers in Palestine in the 1920’s with a pride heritage, a sense of clannish togetherness so essential to group survival and well-being in a hostile environment. The site of Masada became the performance space of national heritage and with the re-evaluation of the Masada narrative; it became part of the national fiction. 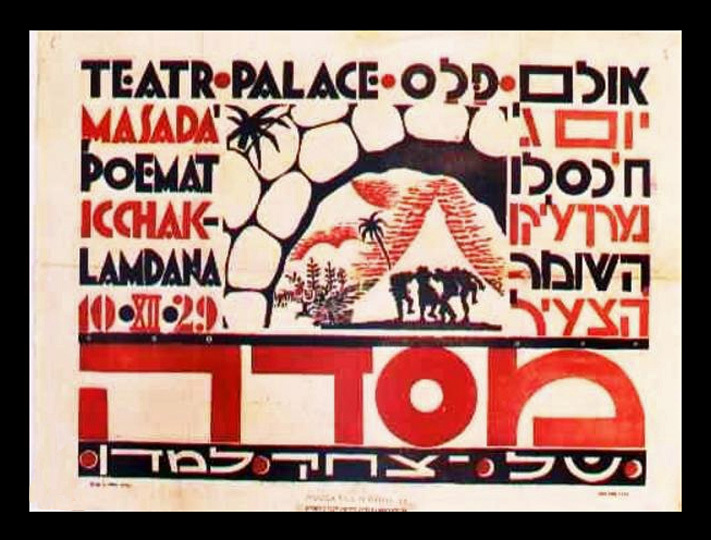 A poem entitled “Masada” by Yitzhak Lamdan became one of the most influential literary works for a whole generation of Jewish Israelis. In the 1920’s Masada symbolized for the poet Jewish emigration and re-establishment of the homeland in British-occupied Palestine and Transjordan with an exodus from places where Jewish life was under constant threat. Masada was used as a symbol, a remnant of a once-glorious past with proud men fighting to the bitter en against tremendous odds. The most quoted line from his poem “MASADA SHALL NOT FALL AGAIN!” conveyed power, reinforcement, and faith amid human doubts and fear. The educational authorities viewed the poem as having a high educational value, and made an integral part of the school curriculum from the late 1930’s. It kept this prominent position until the early 1960’s. Masada the poem was accepted by an entire generation as the symbol they could identify with its emotional and ideological message.